D S Walsh Limited are based in Surrey providing electrical services in Coulsdon, Banstead, Caterham and the local area. They are qualified electricians with many years of experience with both domestic and commercial customers. They also take care of security solutions for your home and business with CCTV installation, burglar alarms and security lighting. Looking for an electrician in Banstead, Coulsdon, Caterham? 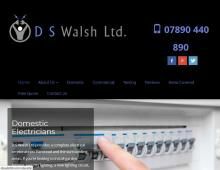 Contact D S Walsh Ltd – electricians in Surrey.